1. Sale Ad-Yes the Sale ad at County Market will be filled with Frito Lay, Pepsi, Nabisco, and Keebler deals. Check here first to get a good idea of what your main stock up snacks will be for the coming weeks. County Market is offering $5 back on any combination purchase of $25 in combined Frito Lay and Pepsi products. ALL PRODUCTS are on sale in addition to the buy and get offer. 2. Look for immediate coupons and rebates attached to products. 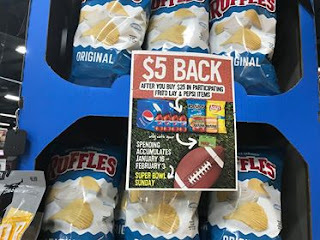 I found Miller had a bottled water offer, Frito has a Free dip with chip purchase, and Pepsi had coupons attached to their products. These coupons can be added to the "Buy and Get" offers mentioned in the sale ad. You can bring your own coupons from home, purchased online, or look for coupons in stores. 3. Look for additional offers on apps. Ibotta has $1.50 on Mountain Dew and Frito Lay combination. 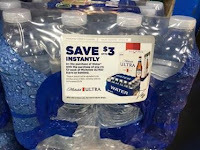 Yes, it is an additional $1.50 to your pocket in addition to the above deals. Fetch Rewards also has credit when you purchase providing points that will later be translated to dollars. 4. File a rebate! There are more beer rebates for Super Bowl than another time of the year. Look for Heineken, Corona, Budweiser, and Miller. They have good rebates on many groceries. Keep in mind states like Missouri are no beer purchase required to redeem the rebate. Yes, again, this is additional money paid by mailing your receipt after purchase. 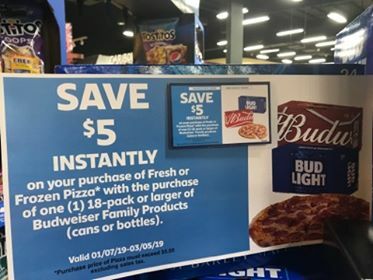 If you combine all these offers, you will pay less than 40% for your purchase. Think about $10 instead of $25! 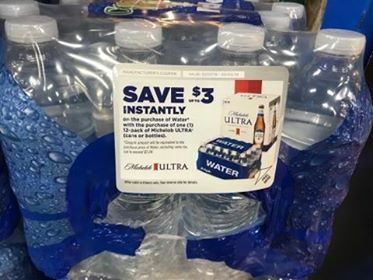 That's a huge savings on top name brand items.